The leakage of the report of the Justice R S Pathak Inquiry Authority into the oil-for-food scam submitted to the Prime Minister last evening pulverised the Lok Sabha and the Rajya Sabha today with the Opposition accusing the Congress-led UPA government of committing contempt of Parliament. Should school buses be banned from plying till they comply with safety norms? All that I can know is that there is no leakage from my office, certainly not from my side. Justice Pathak today scoffed off any idea about the leakage of the report of his findings on the Iraqi oil-for-food scam to media, saying the office of the inquiry authority under him had no role in leaking the report to any one. 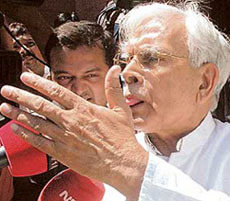 The Congress leadership will decide on former External Affairs Minister K. Natwar Singh’s fate only after the Pathak authority report is tabled in Parliament along with the Centre’s action taken report. A new Pakistani nuclear reactor is likely to be used for “military purposes,” Pakistan’s Ambassador to the U.S. said on Thursday. In an interview with the Washington Times, Ambassador Mahmud Ali Durrani denied, however, that this would lead to a massive increase in the country’s nuclear arsenal. Following the arrest of a suspected Pakistani spy from the vicinity of the Armoured Corps Training School and Centre in Ahmednagar yesterday, intelligence agencies today arrested his three accomplices from different places. A joint team of the Mumbai and the J&K police has arrested a terrorist of the Lashkar-e-Toiba (LeT), Abdul Hameed, from Poonch district in connection with the serial train blasts in Mumbai. A son and a nephew of Punjab Pradesh Congress Committee chief Shamsher Singh Dullo, along with two youths, were reportedly detained by the Himachal Pradesh police today. The police said the boys had allegedly fired from an automatic weapon near Shimla and tried to outrage the modesty of a girl today. 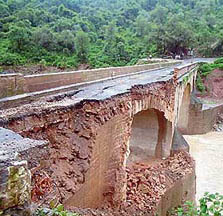 The-86-year-old Bathu bridge, lifeline of the Kangra valley connecting this lush green valley to the rest of the state and neighbouring Punjab, near Ranital, 14 km from here, on the national highway collapsed in the wee hours today following incessant rain.